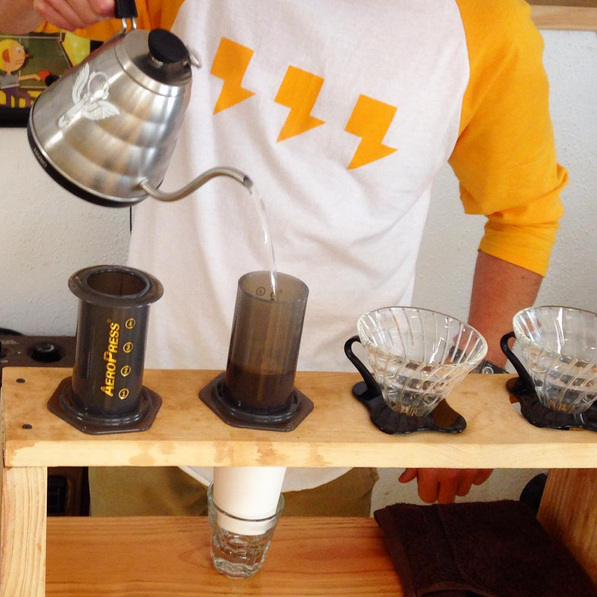 There is another very cool and successful cold brew bottling company called Slingshot, out of North Carolina, and their cafe is only open on weekends... it's called Weekend. While that was appealing, I have always been an advocate for Happy Fridays, and Mondays are when you really need coffee, so we tacked on Fridays and Mondays, too. When the Lab did experiment with being open six or even seven days a week, well, frankly, it was really slow. Now, we know it could be a vicious cycle: the less we're open, the less people will come. But we looked at the stats and decided to rework it anyway. Even though a good ol' classic coffee shop should be open by 7am at the latest, we were just brewing alone until 9am - so we split the difference and now open at 8am on weekdays. In the evening, 5pm is when a lot of folks get done with work, so we decided to give them one extra hour, till 6pm. Saturdays and Sundays we went with 10am-5pm for similar reasons, keeping those two days the same so as not to totally confuse everyone. Oh, by the way, our "OPEZ" sign is just an OPEN sign that you can turn each letter 90° to be vertical, so a friend suggested we turn the N to a Z... so we did. One big reason for our strange hours is that every Tuesday we bottle at the Lab. We brew in several ten gallon Uel Brew buckets at a separate commissary kitchen, then bring sealed jugs of the finished cold brew to the Lab and fill 400-600 bottles by hand. Wednesdays and Thursdays we use for business meetings, errands, and building stuff. When the Lab is open, we love to serve manually brewed pour-over coffee, showcasing amazing coffees from our "Third Wave" Rotating Roaster program. Each month we have a different Rotating Roaster from around the country with a Third Wave approach—generally: light-roasted, single-origin coffees with an emphasis on transparency, sustainability, and treating coffee like the fruit that it is. Our cold brew is always the same locally roasted coffee (which we also sell by the pound) but the Rotating Roaster program brings world-class coffees to Bloomington, sourced and roasted like you won't find anywhere else in town. Our monthly cuppings are one to two hour events in which we taste several coffees from that month's Rotating Roaster. A "cupping" is the industry standard method to taste coffees, a very basic brewing method to highlight the bean itself and not the brewing device. With help from the Counter Culture flavor wheel, we smell and taste each coffee carefully, then talk about each coffee and figure out what's going on. We do these one weekend every month, on a back to back Saturday and Sunday at 2pm. Tuesday nights at 8 will now be our weekly UEL LAUGH Stand Up Comedy Open Mic (Facebook page). Tuesdays fit right between the other open mics in town, the Comedy Attic and Bear's Place, and we are working together to rotate comics between the three venues. Our hours are always a bit of an experiment, and we will probably keep changing them for a while, or seasonally, or something. 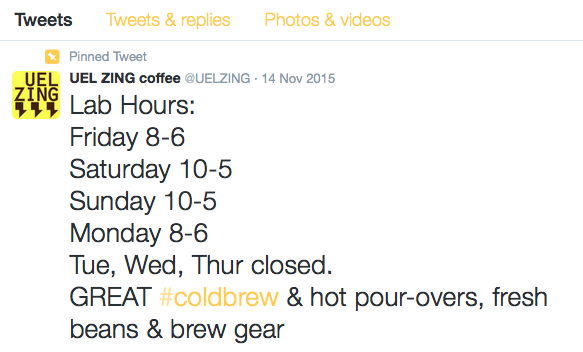 Our Twitter account is usually the most up to date with a 'pinned tweet' of our hours, or you can always call the shop (812-369-4116) or email (iced@uelzing.com) to double check if we're open. Coffee is just such a loaded beverage that it's tricky to time it just right; people want (need?) it almost every day, but not all day long!